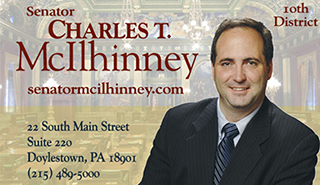 Senator Chuck McIlhinney, Jr. is currently representing Bucks County, 10th Senatorial District, in the Pennsylvania State Senate. He was first elected to the Senate in November 2006 and was reelected in 2010 and 2014. Senator McIlhinney currently serves as Chairman of the Senate Law and Justice Committee, the Senate Game and Fisheries, the Labor and Industry, Rules and Executive Nominations, and State Government committees.